John Gillies, who was at Loch Ness at the same time as me last week, has put up an interesting picture of an object in the loch. 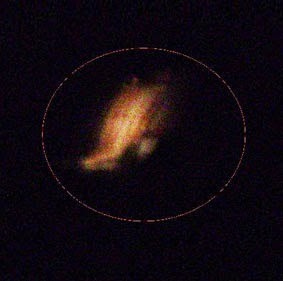 It is a still from a piece of footage taken on the 11th August. The brief clip, as far as I can tell, is not the footage that contains the subsequent still image. I do not think it is a bird as I see no body. Admittedly, a passing wave can temporarily obscure the body, but the surrounding waves do not look rough enough. Perhaps a branch protruding from a horizontally floating tree trunk? Perhaps, but again the same argument applies to the missing bird body. John did not see it at the time of filming, so it is always worth reviewing images when one returns home. Does it have Nessie potential? I would need to see the original film before making further comment. 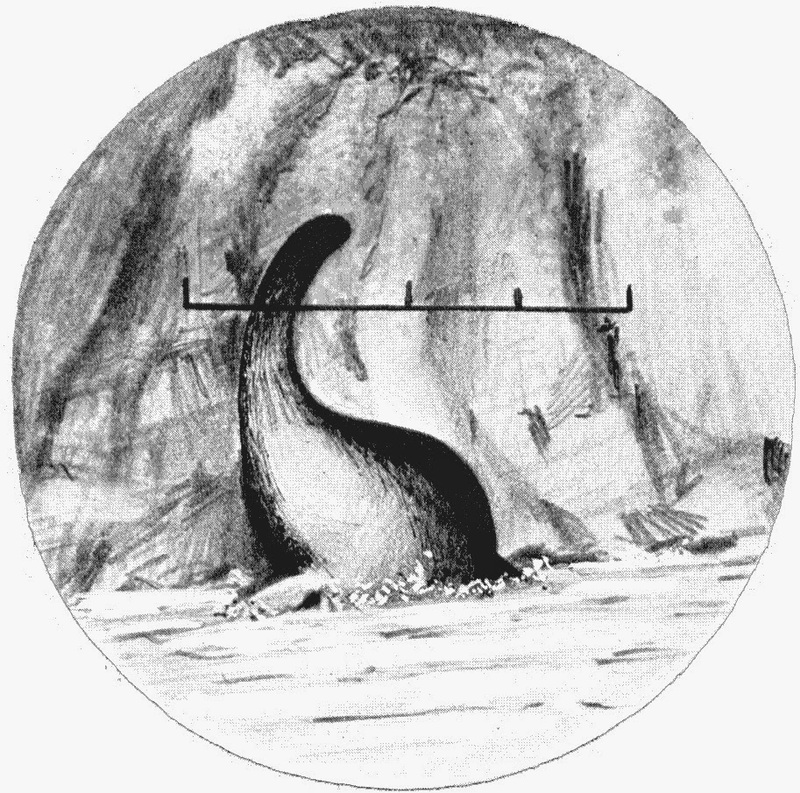 In the next instalment of our occasional series on land sightings of Nessie, it's time to look at what kind of creature was described by witnesses. As stated before, the presumed advantage of a land sighting is that we get to see much more of the creature as opposed to when it is in the water. When one studies water based accounts, there is sometimes the feeling that you are re-enacting the parable of the blind men and the elephant. In other words, what part are we looking at, how does it fit into the whole picture and just how do these creatures vary as individuals and over their lifetimes and natural cycles? With land sightings, we get a bit closer to the truth; but, again, not wholly there. By way of a panorama, a sequence of witness's drawings are presented. Of the thirty seven land sightings that this blog knows about, we only have seven original sketches, one photograph and one film drawn from them. The sixth sketch below is my own reconstructed from an earlier article from the witness' description. The one sketch not included is Alfred Cruickshank's 1926 sighting (which was never published by Tim Dinsdale). The drawings are all flipped to point the same direction for ease of comparison. I also have no stills from the 1963 LNIB film, which is held by the Loch Ness Project (headed by Adrian Shine). It is now over 30 years since the Loch Ness Project obtained the films, photos, sightings reports and other materials from the Loch Ness Investigation Bureau. To this day, precious little of that has been put in the public domain despite the Loch Ness Project having an Internet presence for a long time. I wonder what LNIB co-founder David James would make of that? The question to ask of you, reader, is what were your expectations of this gallery of images? Did you expect (as some sceptics insist) that each sketch must vary little from the other? Or (more reasonably), you would expect some variation depending on the creature and the witness? In terms of creatures, it is not unreasonable to expect one individual to differ from another. Male may differ from female, young may differ from old and a sexually active creature may differ from a sexually inactive one. They may even differ in colour as some other animals do. In terms of the witness, they are not going to give a perfect description of what they saw. They will have seen enough to convince them this was no otter or deer, but to ask for details accurate to the square centimetre is not reasonable. But, you may ask, what is real, what is hoax and what is misidentification? The sceptic has a simplistic answer, all fall into the second and third categories. On the other side of the debate, the argument is more nuanced and could fall into any of these categories. Of those 37 land sightings, some may well be hoax and misidentification, but which ones is a rather more difficult task. Some of the arguments put forward by sceptics in this vein may convince their compatriots, but we are more demanding of their arguments on this blog (because, after all, they are more demanding of our arguments on their blogs). But, of the list above, I would put a question mark over the Dallas and Fordyce cases. In the case of Fordyce, either he seriously mis-remembered his account after over 50 years or what he saw has nothing to do with the Loch Ness Monster. The pros and cons of the Dallas case have been covered elsewhere on the Internet. That leaves six cases which are actually quite uniform in their general appearance. Moving onto particular features of the creature, we first look at limbs. Of the 37 reports available, only 11 (30%) mention them. Four of these reports describe them as webbed feet, with two of these adding the details that they were three toed. One of the reports describes them more as like pig hooves (i.e. two toed). However, three of the eleven reports describe them as flippers. The remaining limb reports do not add any further details. Now webbed feet are not the same as flippers. So, unless one set is discounted at the expense of the other, how are they reconciled? If we take the view that the creature does indeed have webbed feet (which I tend to favour), then it is possible that these can be presented as flipper like. In fact, an idea originally suggested by (I think) Bernard Heuvelmans, would have the webbed feet observed in an open or closed position. I think the picture below of the rear flipper of a seal conveys that idea best. It is a matter of guesswork whether the webbed feet lock into a closed position or just just relax into that position. The "floppiness" or fluidity of this structure is highlighted in these reports. In fact, enough to suggest its flaccidity is due to the absence of a spinal column in that part of the body. Another curious feature is mentioned in two reports separated by forty years. It is this strange side to side movement of the creature’s neck as it headed back into the loch. I think there are two ways of looking at this. My own opinion is that it is another argument against the traditional head neck interpretation. The reason being that if the creature has two eyes at the end of a head, then it is going to be looking straight ahead of its intended destination. Twisting the neck in other directions other than the direction of travel suggests that eyes are not a feature of the end of the “neck”. However, there is another interpretation, and that is the idea that the monster has poor or non-existent eyesight brought on by millennia of living in dark, peat stained waters. In that case, there may be vestiges of eyes in the usual place but they are not employed in a meaningful way (apart from sensing basic light levels). In either case, this would suggest the described neck movement is not without purpose and may have another sensory use. Is the neck being used in the same manner as a blind man’s stick to find obstacles or is other sensory data being collected based on smell, vibration, electric fields or something else? Your guess is as good as mine. In regard to the head and neck of the monster, one final case needs to be mentioned. That is the account Alfred Cruickshank wrote to Tim Dinsdale in 1960. Tim describes the drawing as showing a shortened neck which he states is contrary to the standard long neck model. I would agree that it would, but I would suggest it is consistent with a neck which is more retractable and pliable than has been previously thought. Looking at the land reports in terms of other characteristics, movement is mentioned in 15% of reports. It is described variously as "waddling", "lurching", "caterpillar-like" and "jerky". The word "rapid" is also mentioned though we are talking about short distances here. It has been suggested that the monster is incapable of movement on land due to its bulk and water-equipped limbs. If the creature does indeed have webbed feet (as mentioned above) then perhaps it is more adapted to land motion than first surmised. The weight issue is not so big to me. A male elephant seal can weigh two to three tonnes and can move at up to 5 mph. There is no requirement for the Loch Ness Monster to be a rapid mover in any case. I will look more at this when I critique Mr. Lovcanski's explanation of the Spicers account. In terms of times and seasons, 26% of reports are stated as being in darkness whilst 43% of reports which state the months are during the winter months of December to February. Does this signify a nocturnal creature or a creature which prefers environments devoid of tourists, boats and noise? Be that as it may, this is a higher percentage than expected for land sightings, if the matter was merely down to misidentification and hoaxes. It could be also argued it is an anomaly for real monsters, but that really depends on your monster "model". Furthermore, we have 9% of reports mentioning the creature carrying an object. This is normally taken to be food and casts the Loch Ness Monster in the role of land predator. I have covered this aspect of Loch Ness Monster reports in a previous article. But I would add one story which I did not add to that article. It comes from the Inverness Courier of the 20th October 1933. The community of Benedictine nuns who once resided near Fort Augustus are now living close to me here at Holme Eden Abbey, and one of the lay sisters, an old Inverness-shire woman , says she can remember fifty years ago talk of an uncanny beast being seen in the Loch, and also that animals grazing by the loch-side disappeared. It may surprise you to learn that there were nuns as well as monks at Fort Augustus. Both are gone now, but the sheep and cows are still here! Talk of loch-side livestock disappearing in the 1880s is perhaps less relevant now with reduced farming and increased fencing, but one wonders if the exploding population of deer provides alternate meals? If you are a believer in a large creature residing in Loch Ness, then these accounts can help form a better picture of the monster. The most interesting aspects for me are the webbed feet and the strange neck descriptions. What kind of species possess such webbed feet? All types from mammals to reptiles to amphibians. My own idea of an amphibious like-fish still comes within that domain, though a more standard fish morphology is less likely. For example, the pectoral fins of the amphibious mudskipper do not differentiate in this way (although they are perfectly adequate for moving on land). Nevertheless, given the diversity of nature's ability to adapt, it would not surprise me if such a fish existed.